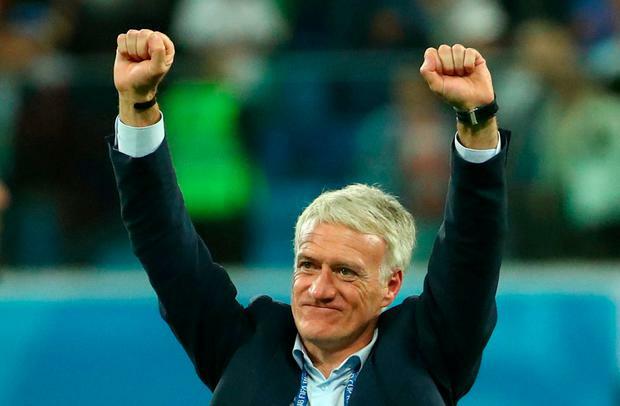 France coach Didier Deschamps heaped praise on his players after they reached the World Cup final with a 1-0 win over Belgium, saying the lost final at Euro 2016 was still on his mind. Samuel Umtiti's 51st-minute header sent the French into the final and Deschamps' side will face England or Croatia on Sunday as they look to lift the trophy for the second time following their triumph on home soil in 1998. "Two years ago, I remember what happened two years ago," he said in reference to his team's 1-0 defeat to Portugal in Paris in the Euro final. "We will go into this final to win it, as we have still not gotten over the (2016) final." Deschamps may have bitter memories from that Euro final in front of a home crowd, but he is now on the verge of joining an elite club of coaches who have also won the World Cup as players. "I feel very proud for my group. We have been 49 days together," Deschamps said. "Everyone can take credit." "It is unbelievable. It is the dream of dreams, the dream of the future, everything," said 19-year-old Mbappe, who tormented the Belgian defence with his runs. "There is still one more step to take, but we are proud of what we have done." Belgium boss Roberto Martinez was also full of praise for his players despite the disappointment of seeing them fall short. "Unfortunately for us the difference is just a dead-ball situation, a set play," he said. "The game was very close, very tight and I thought the attitude and the effort of the players was magnificent. We couldn't ask any more."